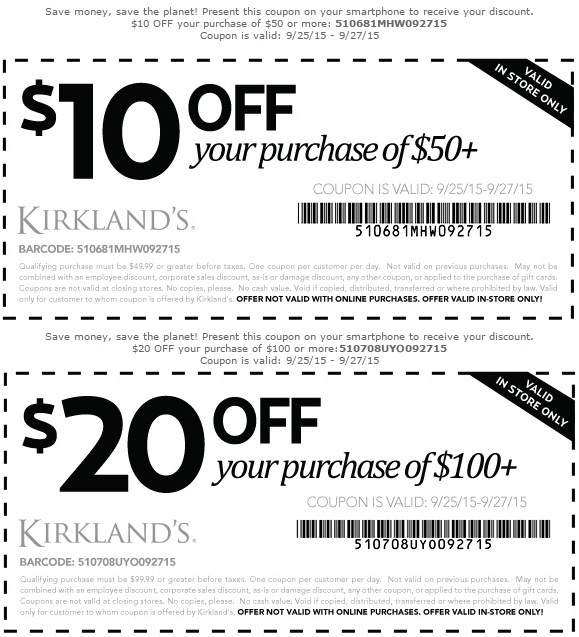 2 ways to save money at Kirkland's stores in the U.S. Possible to get up to $20 off your purchase. You can choose from 2 coupon. First one allows you to get $10 off your purchase of $50 or more. Or, use the second one and get $20 off your purchase of $100 or more. Source of the information is Kirkland's. Coupon must be printed and presented at stores to receive the offer. Offer ends 09/27/2015. More details at Kirkland's stores.